I love everything about autumn. When the temperatures start to fall, I know that good things are right around the corner. Having three fun holidays in a row gives me so many options for outside decorations. This autumn makeover is perfect for Halloween and with a few adjustments in a couple of weeks, it will go right through Thanksgiving. 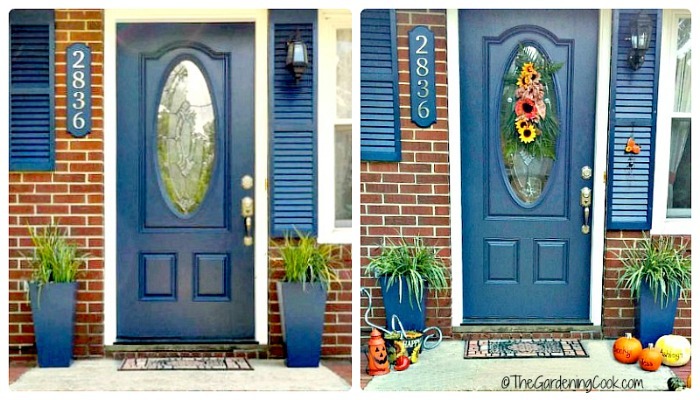 This autumn makeover for my front entry adds seasonal flair and great curb appeal. I love decorating my front porch entry for all the holidays. See how it looks for the 4th of July here. I’ve been a busy bee lately, doing all sorts of new holiday decor projects. I decided to bring them all together on my front entry step. The entry was very pretty as it was. We redid it this summer and we have new doors and shutters to match. All it needed was a few things to say autumn in a fun way. I did this project over the course of a few weeks, to give me time to do my other Halloween and fall craft decor projects. Here is a tip: Do your decorative work with the pumpkins LAST. Even though I did not carve my pumpkins but just decorated them with stencils, two of them rotted as I was doing the other projects. 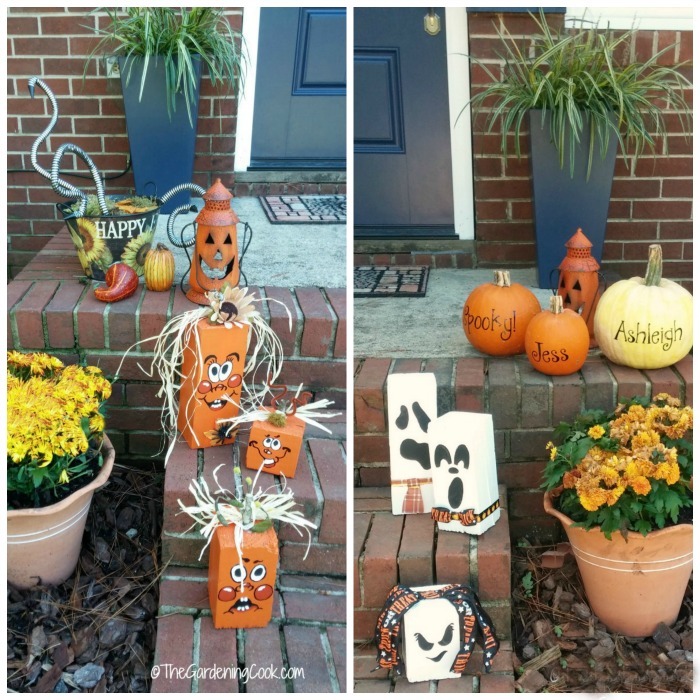 This entry makeover might be more aptly called The case of the vanishing pumpkins, since I had to keep throwing them in the trash as they bit the dust. But before this, I used some Halloween stencils to decorate my pumpkins. The stencils were super easy to use. I just peeled off the backing paper and stuck them to my pumpkins. I had them special ordered in our initials, and the words Boo, Spooky, Jess and Ashleigh for my daughter and our German Shepherd dog. I thought Ashleigh might like being featured, but here she is, saying, I would rather sleep! This is a photo of the monogrammed pumpkins before they started their disappearing act! 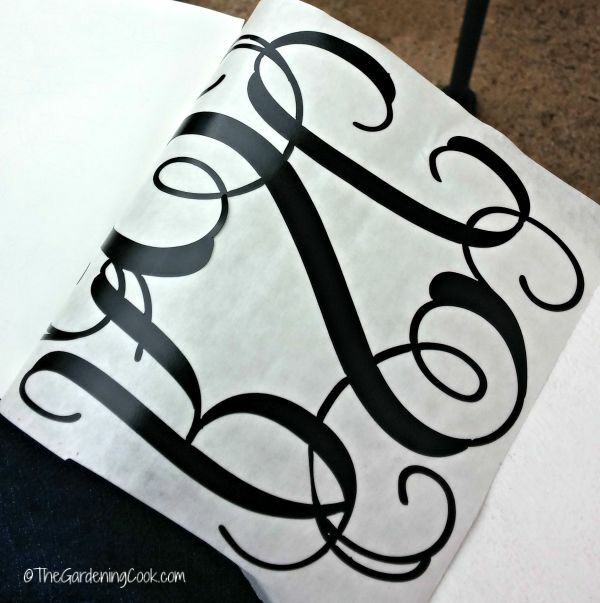 Alas, I only have three left now… I love the look of the monogram decals that I got from from Peppermint Twist at Etsy to make them festive. Next in my step decor comes a spooky snake basket. This project was so much fun to do and came together pretty quickly. The hardest part was finding some snake shapes to use in the project, but luck was with me on a trip to Michael’s craft store. See the tutorial on this project here. Next, I added a colorful Jacko Lantern (dontcha love the name?) to the pumpkin area. I just adore this guy! The crackle paint on him looks so vintage. 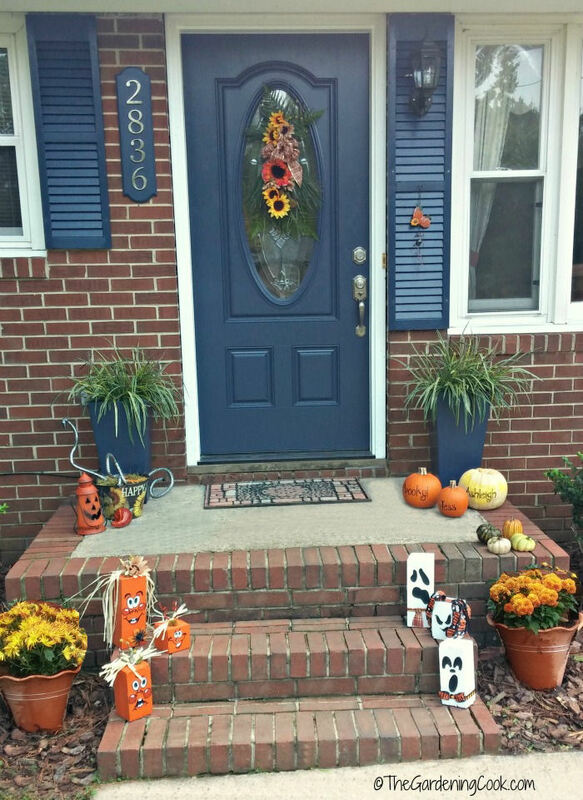 This basket and the pumpkins were getting my entry into the mood, but I wanted something to add to each side of the steps for more seasonal appeal. An old mailbox post gave way to both scrap wood ghosts and some colorful Fall cheery pumpkins. (click these links for the tutorials if you would like to do the projects yourself.) Everything was looking very festive, but I felt that the front door and shutters needed something to dress them up. 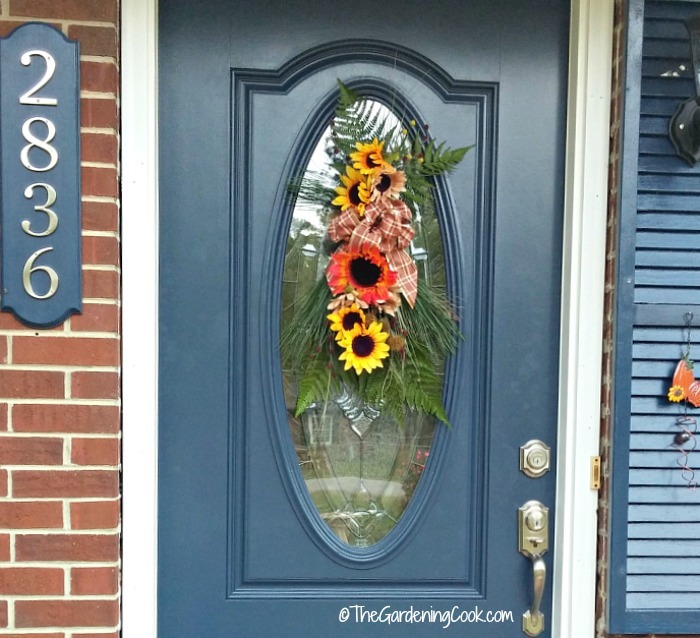 I made an autumn door swag from some yard greenery and a few sunflower stems and added a small chime pumpkin to the shutters that I picked up at the Dollar store. See the door swag tutorial here. A few more Dollar store faux gourds and pumpkins and the stage was set. I love the way it turned out. Very colorful, very festive and a lot of fun. Bet my local trick or treat friends will love coming up the steps to our front door! 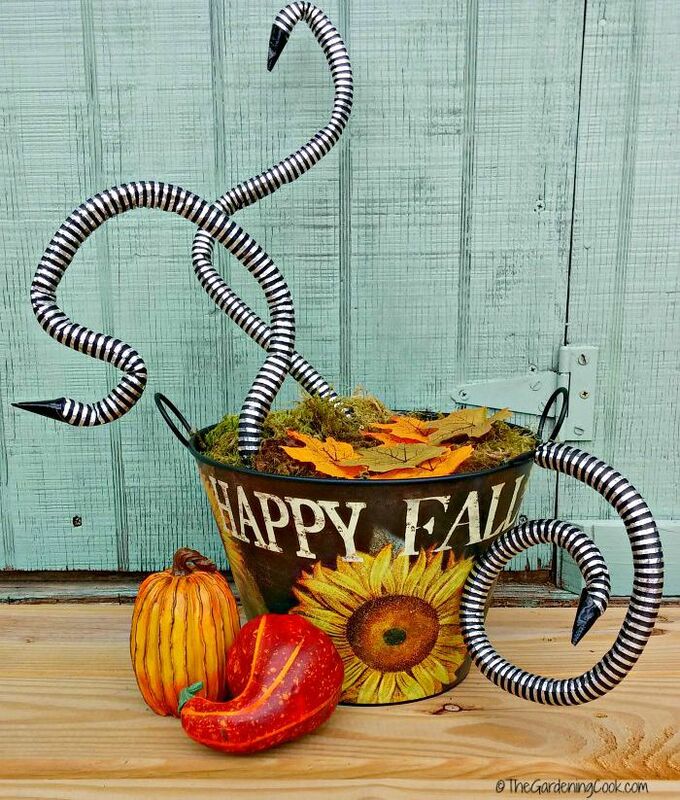 What do you do to decorate your entry for autumn? I’d love to hear about your decorating projects in the comments below! 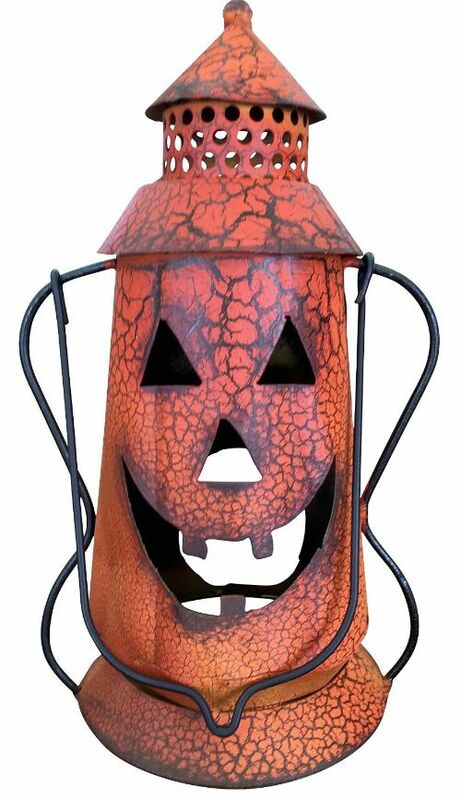 If you have a blog, be sure to join our blog hop and show your Halloween or fall outdoor decorations. Just click the add your link button below to join the blog hop. I love the way the door can be changed to suit the season. See my Easter Door swag here. Wow! I absolutely love those decorations! My husband’s grandfather made me some Halloween-themed wooden decorations for this year, which is the most I have done in a long time. Thank you so much for sharing these ideas. Making a list for next year! They have been a labor of love for me for the past month! Love your door! I need to get out and do mine today too. The stencils on the pumpkins is genius. That way in our hot climate they won’t rot on me. Thanks for the great tips! Same here. So hot that carving pumpkins is out of the question. Awww everything looks so adorable and fall/halloweenish. I needed this inspiration to get to work on my front entry door and deck. I just love decorating this time of the year! 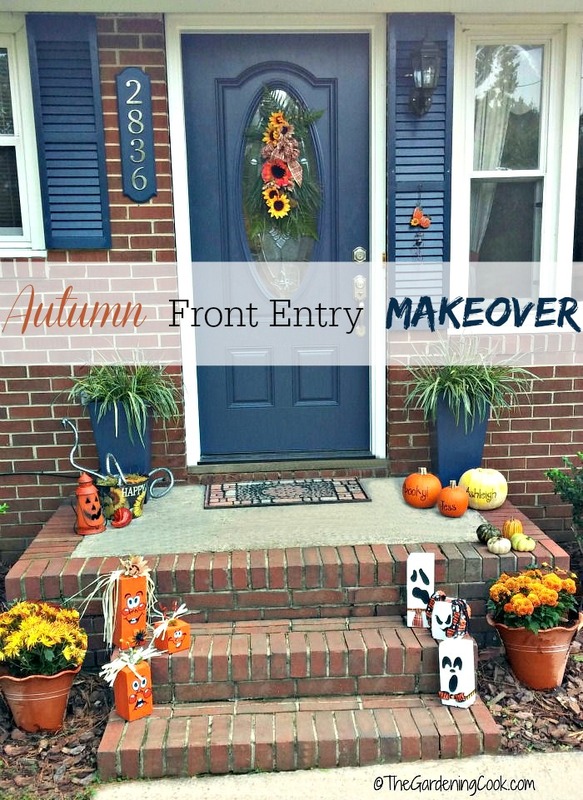 Wow, I LOVE your front entry- so fun and festive for Fall. I especially love the pumpkins and ghosts on the steps! Adorable! Those were both such fun projects to do and so easy! CAROL! I don’t know what happened! I am so upset. I have you added to my blog again. I think I must have deleted it when I updated my linky post. I am so sorry. You are on there now, and I plan to promote this post on FB next week so you will be a part of that group. I am kicking myself now. I failed to mention how much I love your decor. Those personalized pumpkins are adorable. The lantern is so fun! I bet he’s really cute all lit up! Heavens Terri…not a problem. Glad you like it all. Hope the blog hop goes well,. Your front porch is so pretty and inviting! And I love the decals you used on the pumpkins. It all goes together so nicely and your home is lovely. So pretty! Thanks Alli. 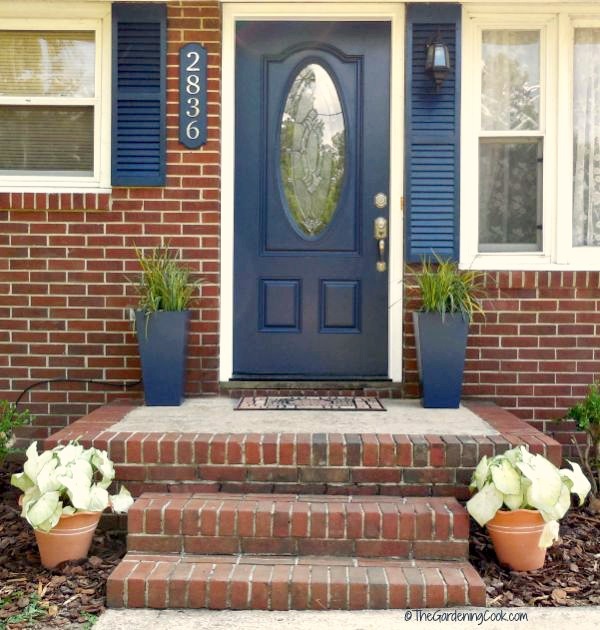 We redid the front shutters and door this summer to the dark blue and I love it. The monogram pumpkin and the flowers on the door are my faves. What a warm and beautiful way to welcome guests! Thanks Jelli. I wish the monograms had lasted longer. They had to get thrown when the pumpkins started to go bad. I absolutely LOVE your front stoop–it should be in a magazine! The intricate details give such a great polish to your holiday decorations. And I LOVE the blue door and shutters. Thank you for the kind words Amanda! The decorations look beautiful. I really like the ghosts made from the mail post, clever way to reuse something old. My favorite type of craft project is using something old and making something new. So cute. I love those pumpkins with the names on them. And the flowers are beautiful. It was nice to include my daughter and my dog on them! This is beautiful! I love the contrast betweenthe navydoor and the fall accents! Thanks Mar. I love the colors too. Oh I love what you did! I saw your front door decoration tutorial. Your front walk area looks similar to mine, I love the pumpkins with the names on it. Thanks Heather. Glad you like it! Ooh, I love how you added the ghosts to the pumpkin blocks. They’re really cute. And I’m loving the new front door colour! We are so in love with that door color too! The pumpkins looks really cool especially the white one. This would really add a sense of spookiness in the area. Wow it looks lovely. You have a gorgeous front entry. This is what I’ll miss from moving this summer is decorating out front of our house, we no longer have space to so I’m totally bummed. This looks great. Once we cut down the dogwood bushes, I was amazed how much room I have for display. Ooohh! Monogrammed pumpkins! I hadn’t thought of that! This was the first year I had done them and loved the way they turned out! OMG that pumpkin lantern is too cute and I love your door decorations! Vinyl on the pumpkins is just perfect! I love Old Jack too. Such a cute face! Your entry looks great! 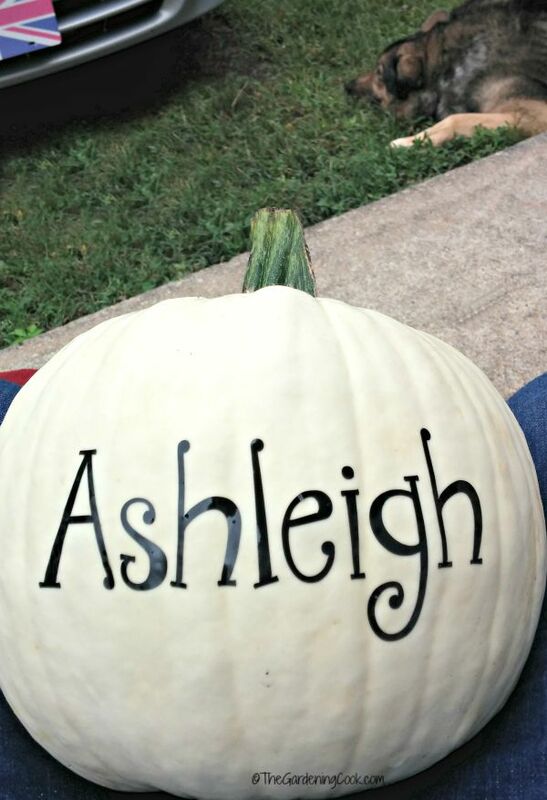 I love the idea of having the names on the pumpkins! The wooden pumpkin blocks are also super cute, great job! Thanks Chantal. Glad you like it!